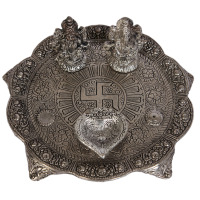 This hypnotic diya stand is certain to require your breath away with its scintillate end and exquisite style. 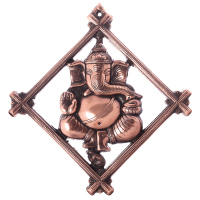 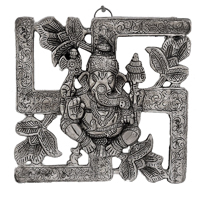 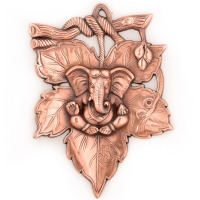 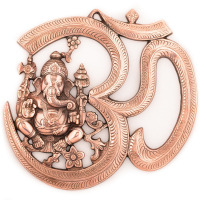 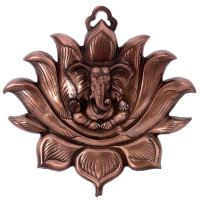 The metal wall hanging of lord ganesha is a work of pure art and splendor. 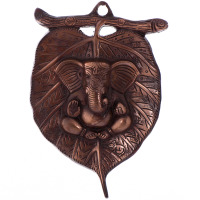 Made of pure metal tinted with the color of bronze this wall hanging is ideal for your living room or your puja room. 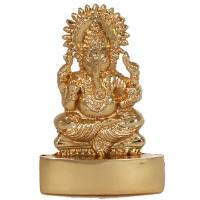 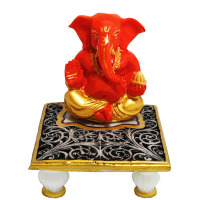 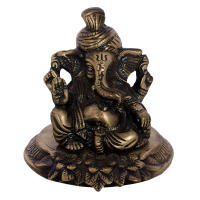 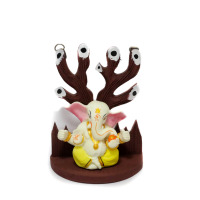 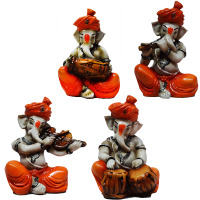 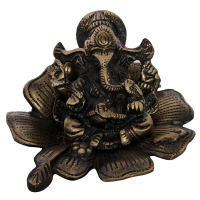 Lord ganesh is a symbol of peace and happiness and this is what the lord ganesha statue on flower home décor symbolizes. 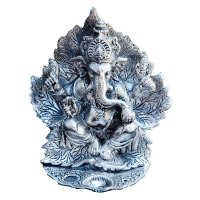 This is one of the most beautiful statues made of white metal and painted with a light tinge of blue for a mesmerizing effect. 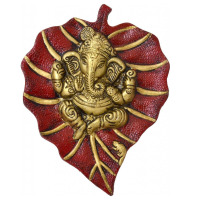 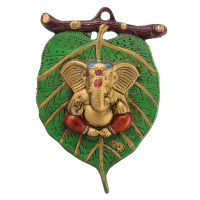 Adorn your home with some of the best looking lord ganesha on red leaf idols. 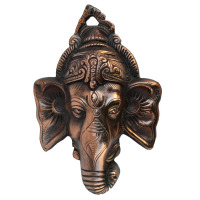 This shimmering metal wall hanging would definitely make heads turn around. 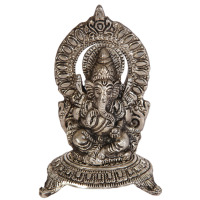 The metal wall hanging of lord ganesha with om will bring a divine serenity to your home décor and the ambience. 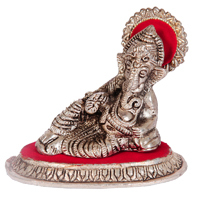 Crafted with the best quality metal, the ganesha along with the om symbol is great for lovers of ganesha.this is surely a wonderful piece of art that will help grab the attention of guests and your relatives..
Enlighten your home this puja with this beautiful looking statue of lord ganesh on creative leaf made from shiny metal which adds elegance and peace to your home. 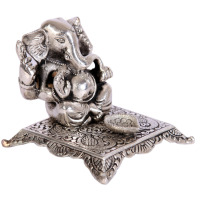 Make heads turn round with awe at this amazing piece of creation that you should definitely purchase for yourself and your loved ones! 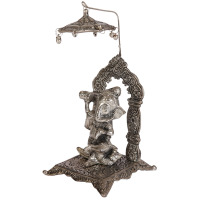 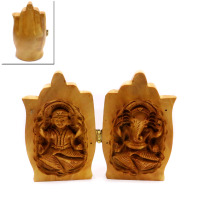 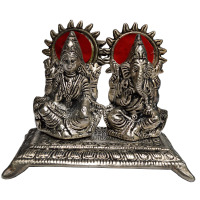 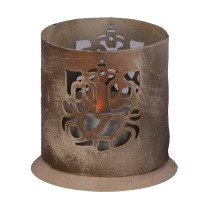 Get the nest offer on this ganesh laxmi shape cutout in candle hanging made from iron sheet. 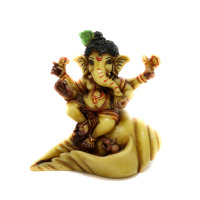 Never deny the blessings of Lord Ganesh as He can shower you with the good luck and blessings. 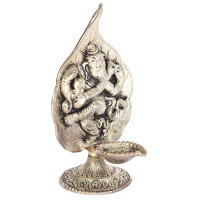 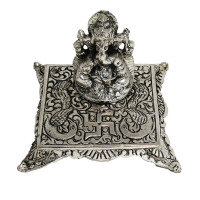 Bring home the Oxidized Metal Silver Colored Lord Ganesh Ji today. 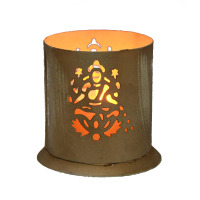 Diwali is one of the most celebrated festivals in India. 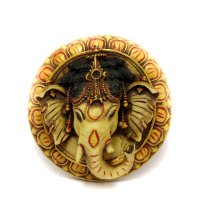 Almost everyone in the country celebrates Diwali - the festival of lights with great enthusiasm and joy. 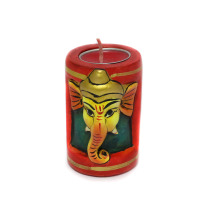 Diwali is the festival that celebrated the win of good over evil, light over the dark and happiness over the sadness. 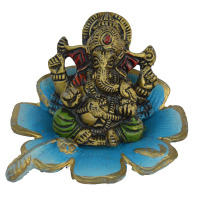 This is one day in which every person wears new clothes, visits to the temple, takes blessings of God and elders and do fireworks in the evening. 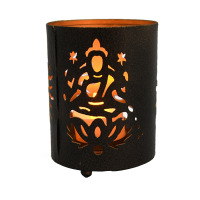 Diwali is celebrated on the new moon day of the Hindu Karthika Month. 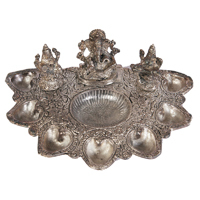 As the entire nation is dark without the moon, the lights of Diyas lit inside and outside the house light up the surroundings. 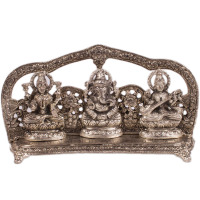 According to Hindu Mythology, once there was a poor brahmin, who was asked to worship Goddess Lakshmi to gain wealth, by the priest. 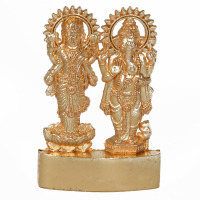 The era in which we live is Kalyug in which Rajo Guna is predominant, people want money, wealth and prosperity, so they consider it essential to worship Lakshmi rather Lord Ramachandra, the personality of Godhead. 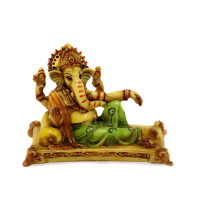 Another legend says that Diwali falls during the quarter of the year when Lord Vishnu, husband of Goddess is sleeping. 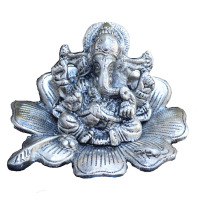 Lord Vishnu sleeps from the 11th lunar day of Ashadh (i.e. 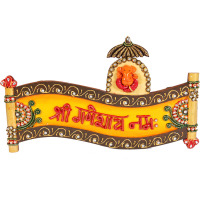 Shayani Ekadashi) to the 11th lunar day of Kartik (i.e. 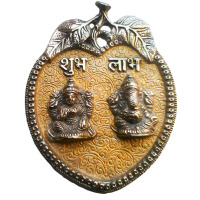 Prabodhini Ekadashi). 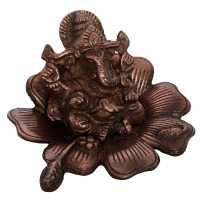 Diwali marks the death of many demons like Narkasur by Lord Krishna, the arrival of Lord Rama to Ayodhya after killing Ravana and Lord Vamana defeating the arrogant Bali. 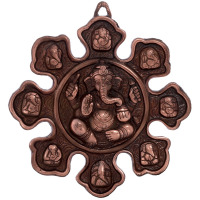 Diwali is the symbol of prosperity. 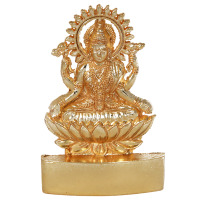 Hence Lakshmi is worshipped. 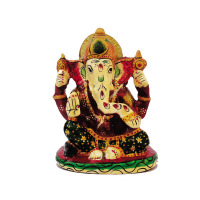 Along with Goddess Lakshmi, the elephant-headed god Ganesha is too worshipped. 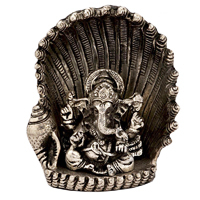 It has believed that Goddess Lakshmi adopted Lord Ganesha from his mother, Parvati. 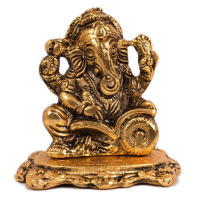 Out of her love for Ganesha, Goddess Lakshmi declared that all her luxury, prosperity and accomplishments are Ganesh's as well. 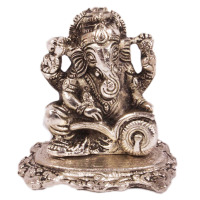 She also said that in all the three worlds, (tri lok) anyone who doesn't worship Ganesh with her will never see prosperity in his life. 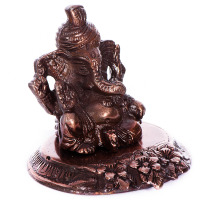 That is the reason Lakshmi-Ganesh Idols are worshiped together in Diwali Pooja. 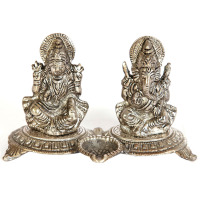 Therefore, to bring prosperity and to wish good fortune and luck, people prefer to present Lakshmi-Ganesha idols as Diwali gifts. 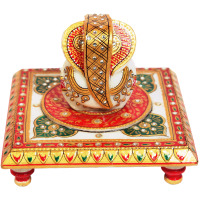 The tradition of exchanging Diwali gifts has grown to new heights in present times. 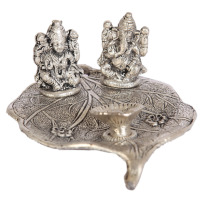 These days, exchanging Diwali gifts with friends, relatives, neighbors, colleagues and business associates have become a tradition. 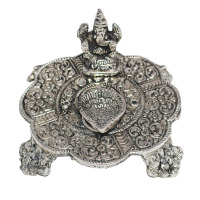 Unlike any material thing corporate houses and people look for something traditional. 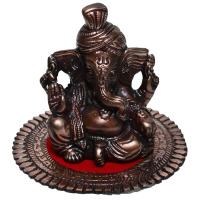 The best conventional gifts for Diwali are Lakshmi Ganesh Idols, Puja Thalis, Handicrafts items, showpieces, dry fruit & sweet boxes, chocolates, home decor articles decoratives and fancy Diwali goodies. 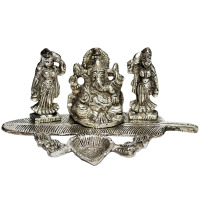 People also exchange electronic gadgets, artefacts, jewellery, wrist watches etc. 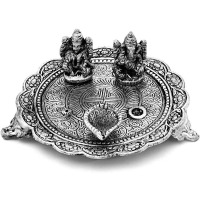 as Diwali gifts. 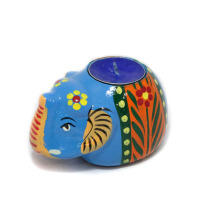 For employees, Diwali is a time of appreciation for their hard work. 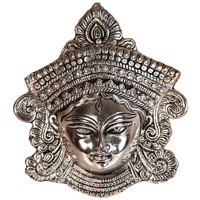 Employees are treated and considered as an asset and powerhouse of a corporate house. 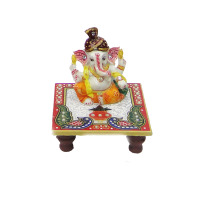 The Diwali gifts are given to motivate them and to boost their morale. 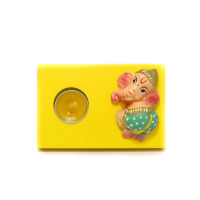 The Diwali corporate gifts are a token of acknowledgement of their hard work and a symbol to let them believe how essential they are for the organization. 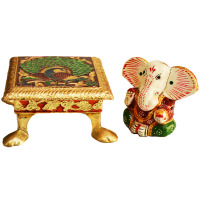 The best Diwali gifts which generally preferred by most of the corporate house to pamper their employees are the Dry fruits & sweets boxes, bowl & glass set, Lakshmi Ganesh Gifts, home decor items and more. 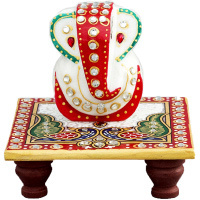 Additionally, Diwali is the time to greet your business clients also. 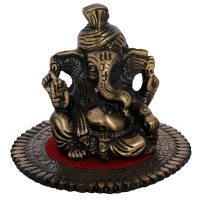 So, along with doing a phone call pamper them with sending excellent Diwali gifts online. 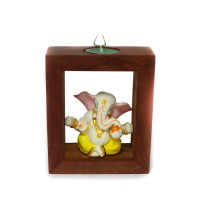 Choosing the right Diwali gifts for clients, employees, colleagues are really complex as it must suit their preferences. 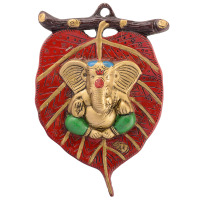 Among the multitude of gift categories, Handmade Items are broadly chosen. 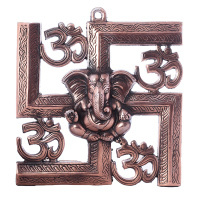 The reason is pretty simple- they are unique in themselves. 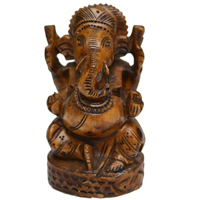 Suppose, if you are dealing with foreign delegates, then present something right from the hands of artisans. 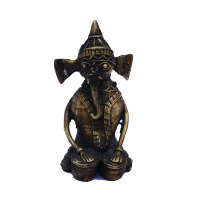 Yes, Indian Handicrafts Items shows the authenticity and rich in heritage. 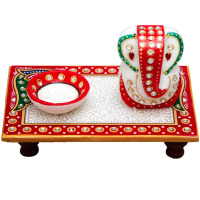 They reflect one’s country culture and tradition beautifully. 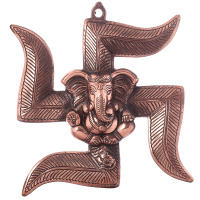 They also indicate how much your roots are attached to your country. 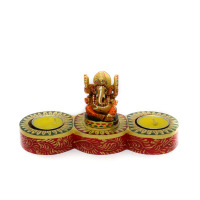 Why Boontoon For Diwali Gifts? 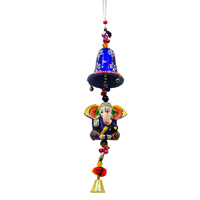 Boontoon offers the comprehensive range of Diwali Gifts. 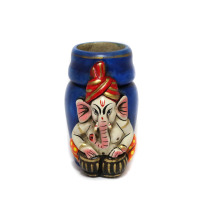 With us, one can find any Diwali gifts online. 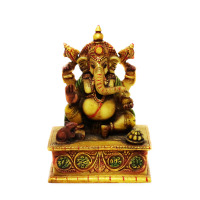 To make it easier and simple, we have categorised the best Diwali gifts under the price slabs like gifts under 300, gifts under 500 and more. 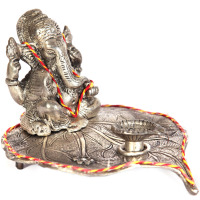 We, have the most extensive collection of Handicraft items, be it a Rajasthani Handicrafts of Gujarat handicrafts, we have it all. 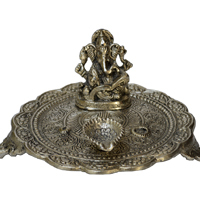 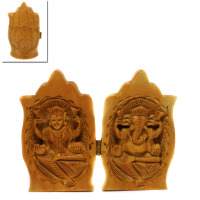 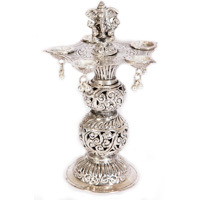 We also accept bulk orders and deliver Indian crafts not only in India but all over the world.